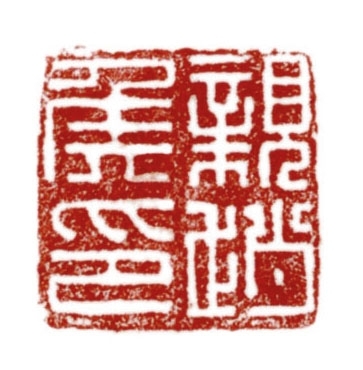 cast with four characters in intaglio which may be read as 親趙侯印 (Qin Zhao hou yin). Compare the cast bronze seal with the same inscription Qin Zhao hou yin, also with a horse-form knob, in the collection of the Palace Museum, Beijing, illustrated by Wang and Ye in Qin Han Wei Jin Nanbeichao guan yin yanjiu (Study of the Government Official Seals of the Qin, Han, Wei, Jin, Northern and Southern Dynasties Periods), Hong Kong, 1990, p. 228, no. 53 and p. 237, no. 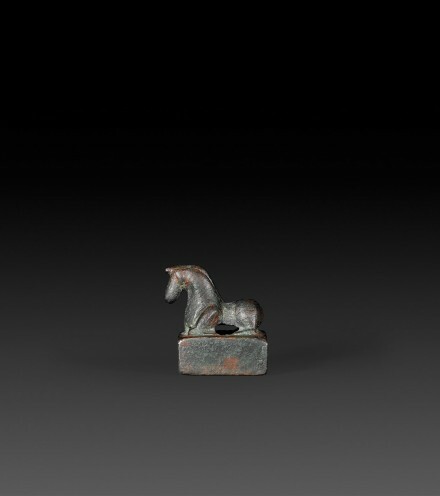 43, with description on p. 220, where the author states that the horse-form knob was in fashion during the Zhao state in the Sixteen Kingdoms Period. Compare also the similarly cast bronze seals with different animal-form knobs bearing similar inscriptions referring to nobles of different rank in the Jin dynasty (265-420) which controlled most of Southern China at the time when the Zhao controlled part of Northern China, illustrated by Cheung, A Catalogue of the Special Exhibition of Bronze Seals Throughout the Dynasties in the National Palace Museum, Taipei, 1987, p. 308, nos. 225 and 226.